Frosty mornings and cool evenings means we are turning up the vaporisation to keep ourselves and our houses warm. To see ‘warmth’ has a physiological affect on us all to whatever extent, ‘see a fire and feel warm type of approach‘. If you chose not to ingest a cosy tralatitious open fire to create a warm glow to a room and still want an interesting maker of heat to countenance at then these stylish and unusual radiators may be just the thing! This new countenance for radiators has been produced by Bumrae Jo and Zemzem Kaya. The concept behind their design was to countenance at heat and see what it means to people’s lives. ‘The heat of the home is creating space for our individualized development, a shelter to grow, to unfold and to ‘flower’. It’s like an incubator, like a NEST where new life has its origin‘. The nest within the ‘tree’ not only adds a quirky interest and maker of fascination, the ‘incubating egg’ acts as a humidifier for the room. The design is called “Bezpieczenstwo - Feeling secure”. I’m not sure that a radiator makes me feel secure, but I have to feature it makes a real and gratifying change from the normal boring white radiators institute in most people’s homes. A definite alternative to MDF ‘fret work’ call covers or attempts to paint radiators in order to try and whatever how disguise them! 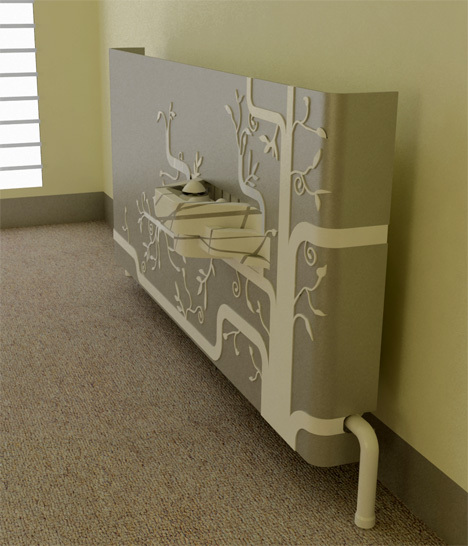 The design works on a kindred principle to having a ‘cover’ for a radiator, the difference being the pipe work which is used for the ‘nest’ section. The front panel is used to cover the entire body of the radiator and nest. Colour choices are available; white with a vivid red tree design or my preference which is the more subtle colours of creams and beiges which attain the design more adaptable for different room colour designs in my opinion.